New Winter 2018: Here’s a personalized sorority ornament every Chi-O will be thrilled to have! The Chi Omega personalized glass ornament offers excellent quality and your chance to customize it with a sentimental message for the recipient. This personalized sorority Christmas ornament is ideal for a daughter or sorority sister for the holidays, a birthday, graduation or welcoming her into the house. As a personalized Greek ornament, it includes her custom information, which we paint on by hand in an attractive font to create a glass personalized ornament that is truly unique. 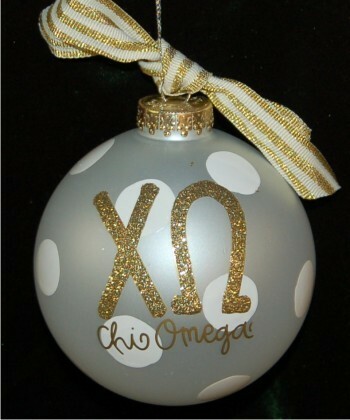 Put a smile on her face with a gift she’ll always cherish, the Chi Omega ornament personalized just for her.